Strangely, amid the spike in racial tensions after the killing of two black men by police in Louisiana and Minnesota, and of five white police officers by a black sharpshooter in Dallas, one American reality has gone unmentioned. The U.S. has been fighting wars — declared, half-declared, and undeclared — for almost 15 years and, distant as they are, they’ve been coming home in all sorts of barely noted ways. In the years in which the U.S. has up-armored globally, the country has also seen an arms race developing on the domestic front. As vets have returned from their Iraq and Afghan tours of duty, striking numbers of them have gone into police work at a time when American weaponry, vehicles, and military equipment — including, for instance, MRAPs (mine-resistant ambush protected vehicles) — have poured off America’s distant battlefields and, via the Pentagon, into police departments nationwide. And while the police were militarizing, gun companies have been marketingbattlefield-style assault rifles to Americans by the millions, at the very moment when it has become ever more possible for citizens to carry weapons of every sort in a concealed or open fashion in public. The result in Dallas: Micah Johnson, a disturbed Army Reserves veteran, who spent a tour of duty in Afghanistan and practiced military tactics in his backyard, armed with an SKS semi-automatic assault rifle, wearing full body armor, and angry over police killings of black civilians, took out those five white officers. One of them was a Navy vet who had servedthree tours of duty in Iraq and another a former Marine who had trained local police for DynCorp, a private contractor, in Iraq and Afghanistan. Meanwhile, civilian protesters, also armed with assault rifles (quite legal in the streets of Dallas), scattered as the first shots rang out and were, in some cases, taken in by the police as suspects. And at least two unarmed protesters were wounded by Johnson. (Think of that, in his terms, as “collateral damage.”) In the end, he would be killed by a Remotec Andros F5 robot, built by weapons-maker Northrop Grumman, carrying a pound of C4 plastic explosive, and typical of robots that police departments now possess. In other words, this incident was capped by the first use of deadly force by a drone in the United States. Consider that a war-comes-home upping of the ante. Already, reports the Defense One website, makers of military-grade robots — a burgeoning field for the Pentagon — are imagining other ways to employ such armed bots not only on our distant battlefields but at home in a future in which they will be “useful, cheap, and ubiquitous,” and capable ofTasing as well as killing. 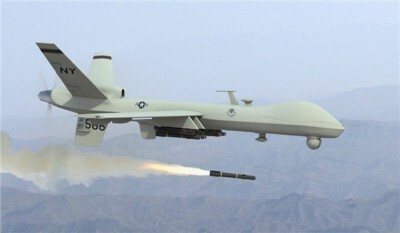 Of course, among the many things that have also come home from the country’s wars, Predator and Reaper drones are now flying over “the homeland” on missions for the Pentagon, not to mention the FBI, the Border Patrol, and other domestic agencies. So the future stage is set. Once you’ve used any kind of drone in the U.S. to kill by remote control, it’s only logical — given some future extreme situation — to extend that use to the skies and so consider firing a missile at some U.S. target, as the CIA and the Air Force have been doing regularly for years in places like Afghanistan, Pakistan, Yemen, and Somalia. And of course, in our domestic arms race, with small drones commercially available to anyone and the first of them armed (no matter the rudimentary nature of that armament), it’s not hard to imagine a future Micah Johnson, white or black, using one of them sooner or later. After all, Johnson was already talking about planting “IEDs” (the term for insurgent roadside bombs in our war zones) and a flying IED is a relatively modest step from there. Think of it as the Trojan Drone, the ultimate techno-weapon of American warfare in these years, a single remotely operated plane sent to take out a single key figure. It’s a shiny video game for grown ups — a Mortal Kombator Call of Duty where the animated enemies bleed real blood. Just like the giant wooden horse the Greeks convinced the Trojans to bring inside their gates, however, the drone carries something deadly in its belly: a new and illegal military strategy disguised as an impressive piece of technology. indicates that even when operators target specific individuals — the most focused effort of what Barack Obama calls ‘targeted killing’ — they kill vastly more people than their targets, often needing to strike multiple times. Attempts to kill 41 men resulted in the deaths of an estimated 1,147 people, as of 24 November . Someone with the same name as a terror suspect on the Obama administration’s ‘kill list’ was killed on the third attempt by U.S. drones. His brother was captured, interrogated, and encouraged to ‘tell the Americans what they want to hear’: that they had in fact killed the right person. In addition, drone strikes don’t just kill people, including women and children; they also destroy buildings and other property. For example, the Bureau of Investigative Journalism says that, in Pakistan, more than 60% of all strikes target domestic buildings — people’s houses. In other words, “collateral damage” often refers to the destruction of the homes of any survivors of a drone attack. Potential negative effects of HVT operations include increasing the level of insurgent support, causing a government to neglect other aspects of its counterinsurgency strategy, altering insurgent strategy or organization in ways that favor the insurgents, strengthening an armed group’s bond with the population, radicalizing an insurgent group’s remaining leaders, creating a vacuum into which more radical groups can enter, and escalating or deescalating a conflict in ways that favor the insurgents. There is, however, another problem with this sort of warfare. Such killings — at least when they take place outside a declared war zone — are almost certainly illegal; that is, they are murders, plain and simple. Whatever your view on arachnids, should it really be permissible to killpeople simply because we are afraid of them? After all, that’s what these drone assassinations are — extrajudicial executions of people someone believes we should be afraid of. It is easier to see an illegal execution for what it is when the killer is not separated from the target by thousands of miles and a video screen. Drone technology is really a Trojan Horse, a distracting, glitzy means of smuggling an illegal and immoral tactic into the heart of U.S. foreign relations. Nor is the Middle East the only region where the United States is using targeted killing outside a shooting war. The U.S. military also deploys dronesin parts of Africa. In fact, President Obama’s nominee to head U.S. Africa Command, Marine Lieutenant General Thomas Waldhauser, recently toldSenator Lindsay Graham that he thinks he should be free to order drone killings on his own authority. So much for war and “war.” What about self-defense? At every stage of the “war on terror,” Washington has claimed self-defense. That was the explanation for rounding up hundreds of Muslims living in the U.S. immediately after the attacks of 9/11, torturing some of them, and holding them incommunicado for months in a Brooklyn, New York, jail. It was the excuse offered for beginning torture programs in CIA “black sites” and at Guantánamo. It was the reason the U.S. gave for invading Afghanistan, and later for invading Iraq — before, as Bush administration representatives andthe president himself kept saying, “the smoking gun” of Saddam Hussein’s supposed weapons of mass destruction turned into “a mushroom cloud” over, presumably, some American city. That would seem to rule out most U.S. targeted killings. Few of their targets were people on the verge of a violent attack on the United States or U.S. soldiers in the field. Ah, but in the through-the-looking-glass logic of the Obama Justice Department, “imminent” turns out not to mean “imminent” in the sense that something is about to happen. As that document explains: “The condition that an operational leader present an ‘imminent’ threat of violent attack against the United States does not require the United States to have clear evidence that a specific attack on U.S. persons and interests will take place in the immediate future. The U.N. Special Rapporteur on Extrajudicial, Summary, or Arbitrary Executions has agreed with this view. In his 2013 report to the General Assembly, Christof Heyns noted that international human rights law guarantees a right to life. This right is enshrined in the 1948 Universal Declaration of Human Rights and given legal force in, among other treaties, the International Covenant on Civil and Political Rights, to which the United States is a party. There certainly are legal limits to the right to life, including — in countries that have the death penalty — the state’s right to execute a person after a legitimate trial. To execute someone without a trial, however, is an “extrajudicial killing” and a human rights crime. In the two years since, little of this has happened. Although Obama has continued the job of personally approving drone targets, the CIA still runsmuch of the program.